Like many English composers, Herbert Howells was drawn to the sound of stringed instruments. He recounted the time when Elgar had talked earnestly to him in the cloisters of Gloucester Cathedral about the nature of writing for string orchestra. His advice to the young Howells was to ‘study George Frederick Handel, now and all your life’. The period around the end of the Great War was a rich one, creatively, for Howells. At that stage he had written hardly any of the church music for which he is better known. In fact, despite his training at Gloucester Cathedral, a revelatory time spent with R R Terry at Westminster Cathedral soaking up unfamiliar Renaissance church music whilst a student at the Royal College of Music under Stanford, and a brief spell as assistant organist at Salisbury, there is very little sacred music in his output from this period. What we do have, however, is a remarkable canon of chamber works which is only now beginning to be appreciated – not only for the beauty of the garden it cultivates, but for the originality of its form and content. Howells wrote extensively for solo stringed instruments. Besides the three major sonatas for violin and piano recorded here, the instrument also features in the lovely Three Dances for violin and orchestra; the viola takes the apt role of mourner in the Elegy for viola, string quartet and strings, and appears in a similar role in the central movement of the Concerto for Strings where the elegy is for Howells’s own son and Elgar, jointly. The cello has an unfinished concerto, of which the rugged Fantasia is a reworked version of the first movement. (Christopher Palmer orchestrated the completed second movement which was premiered in 1992, Howells’s centenary year.) All these works, like the chamber music mentioned above, were written before 1938, and most were written in the teens or twenties of the century. Why was this? Two reasons predominate. Throughout his early years at Gloucester and his student days at the Royal College of Music he was regarded as one of the brightest lights of English music. Gerald Finzi described his ‘diamond-cut brilliance’, and Stanford (notoriously difficult to please) termed him his ‘son in music’. However, Howells came from extremely humble origins and had a father who, though Herbert adored him, was a hopeless businessman who became bankrupt, leading the family to inevitable social ostracism. This must, in part, account for some of the hypersensitivity which Howells had to criticism throughout his life, and why he would rather people discovered his music for themselves and then perform it if they liked it. He never publicized anything himself, possibly, in part, because he feared rejection if a work was disliked. The disastrous premiere of the second Piano Concerto in 1925 was just such a watershed which almost stopped Howells composing altogether. Given a lacklustre performance by Harold Samuel and the Royal Philharmonic Society under Sargent in the Queen’s Hall, and a violent reaction from a member of the audience, Howells withdrew the work immediately and suffered a complete crisis of confidence. This only resolved itself through the second reason, the death of his son Michael, aged nine. Ironically, this tragic event unblocked Howells’s creative impasse but led him towards writing principally choral music and away from the mainstream concert repertoire he had written up to this point. My 1917 ‘Phantasy Sonata’ jumped back into my life this morning, pleading imperfections! One can only strive after perfection, too. I began this morning by changing the Sonata’s name. By deed poll I have dropped ‘Phantasy’ from it: the word has begun to frighten onlookers at British Music! The slow movement was too restless and drawn out. That is all different now and an intrusively ugly episode has gone from the last movement. This morning I had a letter from Alex Cohen asking permission to do this very work in Leeds presently. I have suggested the second Sonata instead. I have long, ponderous thoughts on problems of Musical Form … hours spent in an easy-chair, fire-gazing, form-thinking … We want new experiments in form, and a sympathetic consideration of them when they are made. In fact the Sonata No 1 in E major, Op 18, has much in common with the later second Piano Concerto, formally; both are in one long span but divided into three ‘moods’ which correspond to normal movements of differing characters. The unusual thing is that Howells felt the whole structure in both works to be sonata-based, with themes common to all sections so that, while there were indeed exposition, development and recapitulation, these became considerably enlarged and developed to form the whole sections of the work. It is an original concept and must have required a considerable intellectual grasp and creative imagination to sustain logical thematic development over such a span. This analytical discussion does little to persuade the reader of the merits of the piece beyond formal curiosity. Let his mind be put at rest! He will find a work of wonderful lyricism, of emotional power and intensity and a satisfying range of moods. As Howells’s first ‘professional’ foray into the medium (there is a very early violin sonata written in 1911 for his composition portfolio for entry to the RCM) it is a remarkable addition to the repertory. A much bigger work than the first. The ‘Christian Science Monitor’ has something to say about its ‘form’. (By the way, I think I’m a little ‘fed up’ with the idea of moderns continually throwing their thoughts into a mould in which Beethoven and Brahms excelled so I do feel that we youngsters must approach symphonic and sonata forms from new directions.) Composed in 1917, and produced in London last February (1919). I know nothing in violin-and-piano music that is at all like the third movement (a scherzo). Certain themes appear in various disguises in all the movements. For some reason which is not recorded, Howells withdrew this work and it remains in manuscript to this day. However, he must have felt it worthy for a time or he would not have suggested it to Alex Cohen (as quoted above) for performance instead of the altered first sonata. My personal view is that it represented a side of Howells’s musical personality which he did not wish to perpetuate. I suspect that it is similar in its barely veiled Rachmaninovian romanticism and virtuosity to the similarly withdrawn first piano concerto of which only part of the score remains. 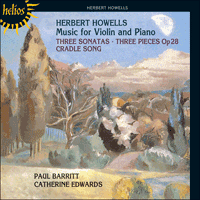 There is a much more direct and straightforward musical style at work here, and little of the mysticism which pervades all the works which we associate with Howells’s personal style and which he struggled to bring to its full maturity through works like the Rhapsodic Quintet for clarinet and strings – one of the best early examples of his mature style. Many criticize Howells’s music as a cul-de-sac – full of lovely things but leading nowhere. Few stop to think how he achieved such a personal style and how long it took him to achieve it. Only now, through the many recordings currently available of earlier works in all genres, can we see what a metamorphosis there was in his writing which led him to the point where he found the style in which he could best express himself. The second violin sonata is a monumental work, full of drama. There are times when the intensity of expression quite takes the breath away. There is little or none of the ruminative Howells here, and to this extent it may serve as a good point of introduction to those unfamiliar with his music. To my mind this work ranks with the Piano Quartet (1916) as the best example of a truly integrated and meaningful piano part in the composer’s output. There is barely a wasted note, and no gratuitous arpeggio figures which occasionally bedevil other works with piano. The second movement, Quasi lento, is fascinating as a pre-echo of Howells’s most famous song, King David written in 1919. The questioning, rising figure in the piano part also features importantly in the song, and the violin part, particularly in its second phrase, conjures up exactly the same feeling. The third movement opens with a reflection of that rising phrase from the second movement and then launches into a raunchy scherzo. Howells was right to think there was nothing like it in the repertory before. In fact, if anything, it conjures up the feeling of the music used for the television series Dr Finlay’s Casebook (the March from Trevor Duncan’s Little Suite of 1960). This movement has an extraordinary sweep to it, with the second subject being a massive chordal idea from the piano with a big-boned melody from the violin. It is heady stuff. Whatever Howells’s reasons for withdrawing the work (and we can only make educated guesses about them), we must be grateful that he did not destroy the manuscript. The Sonata No 3 in E minor, Op 38, was written in 1923 after Howells had seen the Rockies for the first time. In some ways it seems unlikely that a composer who was so often inspired by the homely Englishness of the Cotswolds should find his creative juices churning at something so very foreign to his experience. And yet the music itself describes this dilemma. The first movement opens with almost a topographical drawing of the outline of the Malverns sketched out in the violin part, and yet within a short space of time this has transformed itself into a rugged, marching idea where the whole sound-world is less comfortable. The second movement is a scherzo in which much use is made of alternating pizzicato and bowed playing, and at the end of the third movement the beginning of the sonata is recalled and leads the work to a reflective conclusion. The smaller pieces recorded here were all at one time to have formed part of the same set, but in the end the Cradle Song remained unpublished. All four are ‘character’ pieces written in 1917/18. Of the Three Pieces, Op 28, ‘Pastorale’ is true to its title, being in compound time with a lilting rhythm which is the hallmark of such pieces. It is dedicated, like the first sonata, to Sybil Eaton, a champion of modern British music of the day. ‘Chosen Tune’ is dedicated to the singer Dorothy Dawe whom Howells married in 1920. ‘Chosen’ (or ‘Churchdown’) is the name of a hill just outside Gloucester which commands wonderful views of the surrounding countryside. Howells used to go walking there with Ivor Gurney, and later with Dorothy, as often as possible. His Piano Quartet is dedicated ‘to the hill at Chosen and Ivor Gurney who knows it’. This lovely simple tune exists both as a piano piece and in this version for violin and piano. ‘Luchinushka’ is subtitled ‘A Lament’ and is based on a Russian folk tune. There was a great vogue for things Russian at the time, and Howells’s work Procession, which exists in both piano and orchestral versions, was born out of reading Dostoevsky. The accompaniment to this short piece makes much play on major and minor intervals. Cradle Song is the most extensive of these shorter pieces and shares something of the plaintive quality of ‘Luchinushka’. It has the character of a bedtime story told in that half-hushed tone by a reader who wants to magic a child to sleep on a wing of coloured dreams.